I wrote an essay writing guide last year, the Writing Survival Kit, where I shared 50 tips, techniques and strategies for writing these essays. In your narrative essay, you share something that happened, usually with an anecdote. Now you need to help the reader understand why it mattered to you. These writing tools will help you explore and explain in your essay the meaning of what happened. This will give your essay depth and show the reader how you think, and your ability to analyze and reflect. Even though most narrative essays start with some type of real-life moment or incident (anecdote), they are more than recounting an entertaining story. The point is to share a story in order to examine what it meant to you, and what you learned from it. The anecdote or mini-story will usually only take up the first part of your essay; the rest is all what you have to say about what it meant, its significance. This is when you get to reveal how you think, what you care about and how you learn. After you engage your reader with an anecdote—which illustrates the point you want to make about yourself in the essay—it’s time to go on and explain what it all means and why it matters to you and others. You shared something that happened. That was “showing.” After that, your essay is all about explaining—“telling”—what it meant. 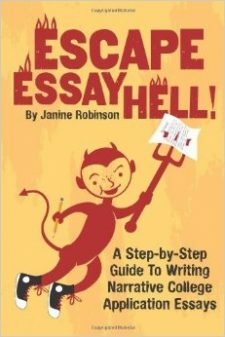 If you like this approach and want to learn how to apply it in a step-by-step manner, you might want to consider my writing guide, Escape Essay Hell! or my online writing course on How to Write a Killer College Application Essay. Or just keep reading this blog!